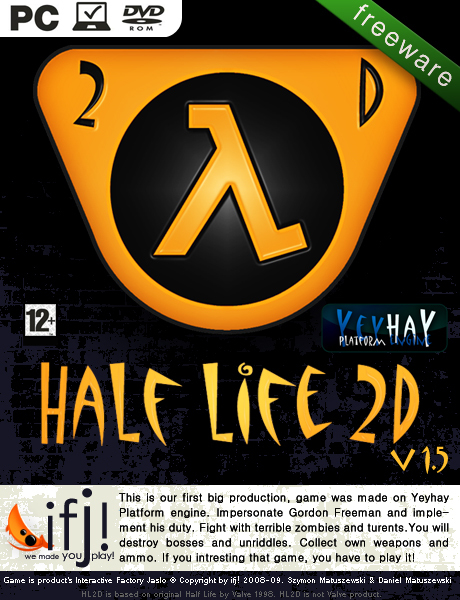 Half Life 2D is Short, adventure platform game made by Valve fans. Goals was to create nostalgic reminder of Half Life 1. Funny song from the end of game. Half Life 2D on Linux/Mac ? Hello there, In about long time, I was thinking about releasing HL2D on other platforms like Linux and Mac. I think conversion should take me a little bit of time, of course it means that it will be update for Half Life 2D, but just small bug fixing and styling. I will be looking for Mac and linux testers in next month, so don't miss it! I think update will be released in November/December. Hi! Nominated for Indie of the Year 2010! Hey! Can u do 3d? Please leave vote for our game, Indie Game of the Year 2009 Mod of the Year 2009. Thanks for playing Half Life 2D. With little delay! It's much better than first version! Is this legal to take donations using Valve's IP? Half-Life 2D: Blue Shift has been teased? I hated this game. it was not obvious that I could go through one of the walls. And fighting the end boss was a pain in the ***. I didn't even bother completing the game. "Buy me a beer :)"
lol dat Barney Calhoun reference. You should change the "original game" link. It should direct to the Half-Life steam page, not the Valve Software main page. You can't install Half-Life DIRECTLY from Valve home page! !